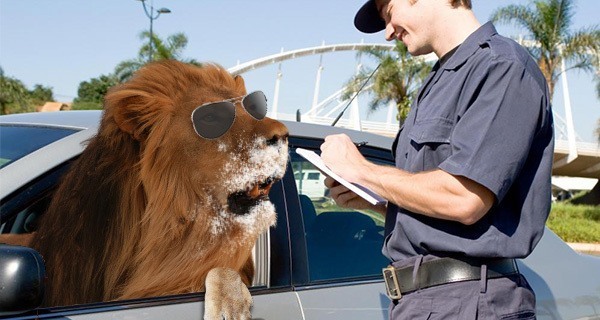 After being pulled over by a police officer in Galveston, Texas, an escaped lion speeding in a stolen Toyota Camry while under the influence of cocaine was allowed to keep driving. Police officer Wayne Futchler spotted the suspicious vehicle driving at 140 mph on the Gulf Freeway yesterday morning. After a 10-minute chase, the driver finally pulled over. Noticing white powder around the feline’s nostrils, Futchler glanced toward the back seat, where he saw nine kilos of cocaine. Bernie the Lion, who had escaped from the Dallas Zoo the night before, was already deep into a drug-fueled spree involving guns, prostitutes, and hate crimes. However, Futchler explained that he used personal judgment and decided to let the lion continue on his way, ascribing his leniency to the recent illegal hunting of Cecil the Lion in Zimbabwe. Since then, Bernie the Lion has continued to surprise and delight residents who have come across his path. One man even created a Kickstarter to raise funds to buy Bernie a new car.